Browse through our selection of wedding reception necessities, and find all your nuptial trimmings in one fabulous spot! From toasting flutes and cake knife servers to bridal accessories and wedding garters; you'll be sure to find a finishing touch perfect for you. 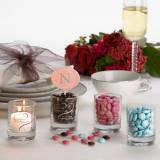 Make your wedding essentials even more magical with our free personalization! Personalized Stemless Champagne Flutes . 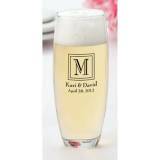 . .
Monogrammed Stemless Champagne Flutes Case . . .